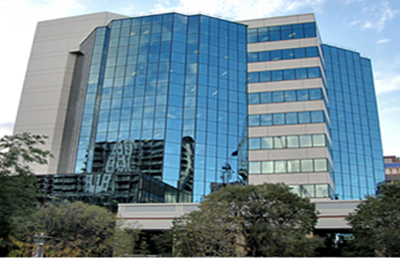 We know the safety and security of your employees and facilities is of utmost importance. Jade Alarm understands your concerns and we can provide you peace of mind with our quality products and services. Jade Alarm Co. is this area's only independent U.L. Certified Monitoring & Installation Company. *(UL # S2515-1) Our Central Station Monitoring Command Center is not run by a subcontracted, out-of-state, third party but is staffed by Jade Alarm Co. employees at our Kansas City headquarters. While computers allow for precision in handling of the signals, we feel that properly trained Central Station Monitoring Command Center personnel make the difference in quality. Our personnel are screened and continually trained as Central Station Monitoring Command Center dispatchers and are proud of the job they do. EMERGENCY PLANNING for Educational and Religious Facilities. Educational or religious facilities are sometimes large, spread out, and vulnerable to acts of violence and terror. With a facility involving groups of students and staff, efficient and effective communication and action are key when there is an incident. JADE ALARM's three step system (Activation, Action/Lockdown, and Communication/Notification) can provide you Peace of Mind in regards to the safety of your students, faculty and/or staff. AS A BUSINESS PERSON it is your job to ensure the safety and security of your people, facilities, and assets. There are so many threats you have to worry about - burglaries are just one of them. In the event of a break-in, the local alarms can be programmed to sound and our Central Station Monitoring Command Center Dispatchers will immediately contact the responding authorities. Our systems can be designed to detect forced entry through doors and windows and unusual interior movement is detected utilizing our sophisticated ProSeries motion sensors. Our ProSeries sensors are so intelligent they detect attempted defeat by blockage or spray painting and prevent expensive false alarms from non-intruder sources. Fire, Smoke, and Heat: Detectors will be installed per local & national code requirements (NFPA-72 & UL) in order to comply with your local Fire Marshal and Insurance requirements. Our intent will be to provide rapid alert and response at the first sign of a fire. Sensors may include intelligent smoke detectors that indicate when they get dirty, standard and rate-of-rise heat detectors, projected smoke beam detectors and even protect-o-wire continuous detection cable to ensure you are provided with Total Strong Security and peace of mind. Fire Sprinkler Supervision: Detectors will monitor the water flow and report of a sprinkler head triggering. For added Total Strong Security we can monitor temperature within the facility to prevent water pipes from freezing and bursting. For dry type systems we monitor the compressor's air pressure to detect failure. Carbon Monoxide Detection: The recent Life Safety Code includes Carbon Monoxide Detection requirements in areas such as day care and school facilities. Jade Alarm Co. offers devices that operate reliably with low false alarm generation. When end of life of the sensor is detected, the system is even intelligent enough to send our Central Station Monitoring Command Center Dispatchers a trouble signal so the unit may be replaced. Traditional stationary hold-up buttons may be added to your system for the safety of your personnel. 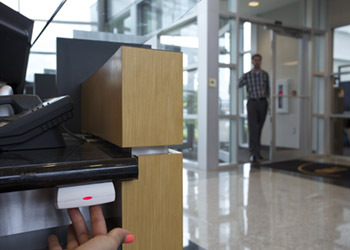 Portable holdup transmitters allow for personnel to summon help even if they are outside the premises. Jade Alarm can add reliable silent holdup alarms to your system for the protection of management and employees. Each person could be issued a portable holdup transmitter that, when activated, results in an immediate signal sent to our Central Station Monitoring Command Center Dispatchers and help is sent. Additional devices such as wireless cash register bill traps and traditional 'hard wired' hold-up buttons may also be installed. The portable units can even be added to your home security system allowing you to carry the same device for both your business and residence. Our systems are so sophisticated they will know if you need help at the office or at your residence from the signal received. You can have continual security when walking to and from your car at work, working at home in your yard and even at night with the device on the night stand next to your bed. Hold-up, burglary, and fire aren't the only threats to businesses today. Shoplifting and internal 'shrinkage' cost business owners millions of dollars each year. A proven, economic way to protect you from various sources of loss has been to install a video surveillance monitoring system. One huge advantage of a Jade Alarm Co. installed and maintained system is that our personnel on each shift verify that your system is operational. The reliability of our systems has helped us to "nail" criminals. Jade Alarm Co. proudly offers both our SecureNet™ and FireNet™ True Digital Radio monitoring systems to ensure your alarm signal gets through. Unlike unreliable telephone, cell, or cable based systems that are easy to circumvent, Jade Alarm's True Digital Radio networks are designed specifically for security & life safety usage. We are there for you - day or night. Do you want to know which of your trusted employees entered the building, and when, or through which entrance while keeping unauthorized persons locked out? Grant only certain personnel entry into the computer room? Then, you need "access control". Jade Alarm Co. give you this control through various state-of-the-art technologies - "swipe-card access", "proximity-card access", keypad code entry, or even handprint recognition. With our managed access system you do not need any expensive equipment at your premises and we take care of updates or changes from our secured servers. Changing keys has never been this fast, easy, or cost-efficient. With SmartLoc rekeyable lock cylinders, you are in complete control of your own security. 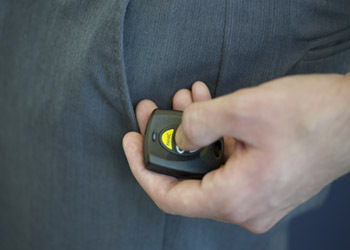 Change keys in seconds, at the door, without paying a locksmith or tying up the valuable time of maintenance personnel. In fact, you don't even have to remove the lock. Our patented technology allows you to reset your lock to match a new key effortlessly. With up to 15 unique key changes per lock, it's like having 15 locks for the price of one.